Two weeks ago, “Homeland” gave us its craziest episode this season, and this week, we got by far this season’s best episode. I don’t think that’s a coincidence. It’s kind of like the show finally sneezed and out of relief was able to relax into a tight, tense hour of very enjoyable television. My own feelings about last week’s pandemonium will, I think, be forever fraught because I looked down at a critical moment and misinterpreted the second biggest moment in the episode as something, well, more real than it actually was. Now I have no idea how I feel. But, to catch us up to this week, let’s review. The ambassador’s husband went full dark side (with no on-screen resistance by the way) and replaced Carrie’s pills with who-knows-what. Carrie, under the influence of that strange green powder, goes on to beat up a hospital attendant, stumble madly through the streets of Islamabad, hallucinate (it turns out) shooting two people, and eventually curl up crying in the arms of Brody Aasar Khan, head of the ISI. That’s a lot to take in, but, crucially, none of Carrie’s worst moments last week seem to have triggered any major repercussions for her in this week’s episode. Aside from prompting some questions from co-workers, which she dodges, Carrie’s breakdown really only served as a mechanism to bring her and Khan together and ultimately expose the ambassador’s husband. In a way, that’s admirable, and I certainly don’t like to imagine the myriad of ways doubling down could have gone wrong, but I’m also uncomfortable with this season of “Homeland’s” tendency to raise big issues and then forget about them. Remember Carrie’s baby from all the way back in that first episode? There’s no reason you should. The show itself seems to have forgotten. Aayan too, as much as I wish this had been true from the start, may as well never have existed for all we’d know watching these last two episodes. And what happened to his college sweetheart and her family? Who knows. Lucky for us, the show’s weird, intermittent amnesia paved the way this week for its best episode in a long, long time. Carrie, of course, realizes someone at the embassy must have sabotaged her meds. While she and the rest of the CIA team confirm this and struggle with the implications, Saul manages to escape (with a clever fake suicide that I don’t think is ever explained). In fact, one of the best scenes in the episode depicts him struggling to pick his shackles with a nail. It’s obviously not easy (as it’s all-too-often portrayed as being in this genre), and the director (Alex Graves, a “West Wing” and “Game of Thrones” vet), by eschewing any kind of time dilation, lets us into this small, critical moment by simply allowing it to unfold in front of us, as long as it takes. Meanwhile, back at headquarters, the Pakistani contingent has returned to the big boardroom to discuss negotiations for Saul’s release. Carrie intuits correctly that their composure must mean they know where Saul is headed, so she and Lockhart excuse themselves to try to steer Saul to safety over the phone. Of course, they can’t. Carrie breaks her promise to let Saul die rather than be recaptured and steers him right back into Haqqani’s men’s hands. It was a truly devastating moment handled beautifully and subtly by Claire Danes, whose ability to portray silent, on-the-edge determination hasn’t been on display like that probably since Season 1. What’s more, the whole episode keeps to a tense, swift pace and more than adequately balances all its moving parts. There’s a thumb-twiddling boardroom upstairs, Carrie and company working beneath them, and Saul desperately running for his life in a small, faraway town. I’m still waiting for a solution to the show’s Big Picture problem, but it’s almost certainly too late for that more than halfway through the season. Without larger context, Haqqani can’t transcend cartoon TV villainy, and Saul’s capture happened too late to provide season-length stakes. Likely the best we can hope for from here on out are four more above-average episodes without much substance to back them up. At least we have that though. And if the rest of the season comes close to the quality of this week’s episode, I may leave this season feeling halfway hopeful about next year’s. Let’s hope so. 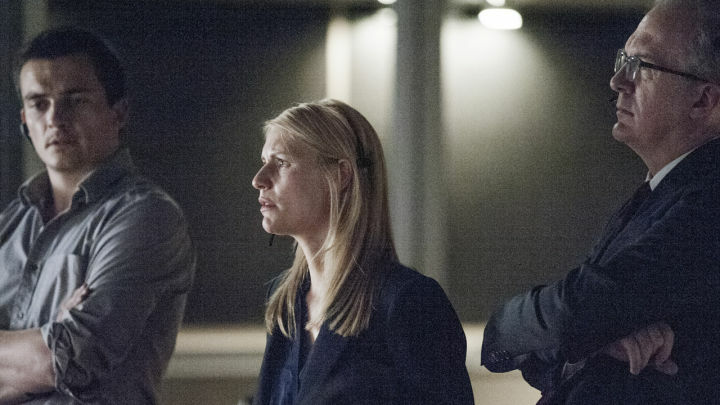 I finally like where “Homeland” is headed.